Neurosurgery Outpatient Services Manager Blake Bohe rows a portion of her 12,000 meter effort at a recent Row4ALS fundraiser. 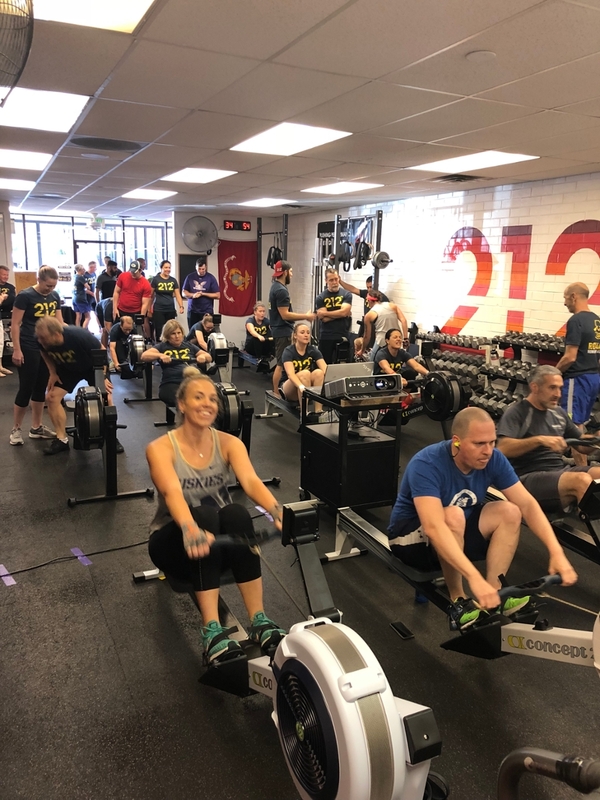 When Danielle Freeman, Director of Outpatient Services for University of Utah Health’s Neurosciences Service Line, stepped into a local gym on a late September weekend, she knew she was about to get a taste of the 3,000 mile journey team ROW4ALS will undertake in the next week. By the end of her 50 minute training session—part of a public fundraiser and awareness raising event for ALS—Danielle was physically exhausted, but filled with an even greater appreciation for the magnitude of the team’s challenge. "It’s one thing to row on a machine for an hour on a single day, and certainly another to imagine it as a lifestyle over two months." When she and fellow U of U Health staffer, Blake Bohe (manager of outpatient services, neurosurgery), arrived at the event, they could sense the hard work and intensity of the rowers competing in the heat prior to theirs. Blake, a talented rower in her own regard, led their two-person team to collectively row more than 12,000 meters. "It was harder than I expected,” says Danielle. “I initially compared the physical exertion of rowing for 50 minutes to that of running for the same amount of time—not easy, but manageable. Rowing was definitely more difficult for me!" As the row ended, Danielle reflected on her experience warmly, exhilarated by the physical challenge, friendship, and camaraderie present in the group, but says she still has trouble placing herself in the ROW4ALS crew's shoes for 45 days. "I barely survived 25 minutes,” she jokes. “The ROW4ALS team is unparalleled, and Alan is truly in a league of his own, taking on this amount of physical and psychological strain in addition to living with ALS." No doubt the race will push each team member to their limits, but we know team ROW4ALS is up to the challenge. For nearly two weeks the team has been making final preparations in LaGomera, Canary Islands, where the race will launch on December 12th. During this time, Alan and the rest of the crew are spending their final moments on land testing and installing equipment, participating in social events with other teams, continuing to train lightly, and making sure their craft and each team member is ship-shape condition. University of Utah Health is cheering on Team ROW4ALS, and can’t wait to watch their progress. Stay tuned for more details and team updates, coming soon. And be sure to watch for a link to the official up-to-the-minute race tracker, live on race day!